This super spicy gift set has 3 delicious sauces that are made with the hottest peppers in the world; Ghost Pepper, Scorpion Pepper & the Carolina Reaper! 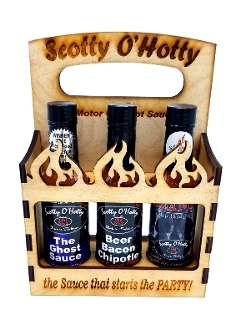 The "superhot" 3 pack features our #1 award winning The Ghost Sauce, Beer Bacon Chipotle W/Scorpion Pepper & the hottest sauce we offer; Reaper de Muerte!! Includes a hand crafted carrying case that is perfect for cookouts.